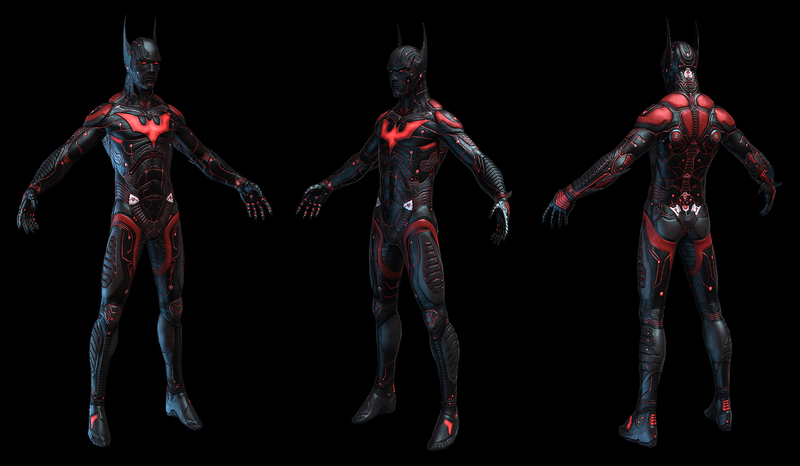 Posted on December 28, 2011 by Chris A.
P:R Redesign: Guy Bourraine Jr.’s Batman Beyond! Note: As the buzz builds for The Dark Knight Rises, artist Guy Bourraine Jr. is already looking forward to what could come next. The Miami-based artist posits a film franchise centered on the future Dark Knight — Batman Beyond — in these mock posters for a 2015. I think I’ve already bought my tickets on Fandango. – Chris A. Tagged Batman, Batman Beyond, Guy Bourraine Jr. I think the simple, beautifully rendered mystery of the back-lit image would put a lot of bodies in the theaters. It’s been what, a decade since I saw this show, but did Terry always have the little cape? I understand showing off the suit design (Wolverine torso stripes? ), but it would make the second image work for me. Still, it makes me want to see much more from this artist. Oh my god! This is awesome! GREAT design! Fantastic everything! I could so see that working in live action. Personally I’m not sure about the bottom part of the mask. I’d have made it a full face mask, that opens at the bottom to reveal the mouth (a la Prime in Transformers films) except that it still has a full mouth shield but it’s tinted. Very cool. I like the anime armor styling to the Timm design. Also reminiscent of Adi Granov armow, which is never a bad thing. Would have liked to see more seems around the mouth for expressions. @Mike- Yes he always had them, though they were red and only came out when he was gliding. I’m actually liking the little added flourishes of red on the suit, glowing and such, it adds more depth to the costume. Despite being a huge Batman fan, I’ve never quite gotten on board with Beyond. I always felt, “If it ain’t Bruce, it don’t count”, but over the years– with a number of artists and writers giving the character a more “serious” treatment (no disrespect to Bruce Timm)– I’m starting to come around. And this beautiful artwork is a prime example of that. I love seeing the articulation of the suit, it let’s us know exactly what the hell it is– the animated series’ version always seemed to me some sort of generalized nanotech/symbiote, and just not “Batman”. If DC does in fact go forward with a live action BB franchise, this design would be a great launching point. Pretty, but very, very bland. It’s the same problem the costume in the actual show had. The link John Green posted has the opposite problem. It’s obnoxiously noisy. I think it is simply amazing. This design is interesting and not overbearing at the same time. A Batman Beyond movie is going to have a very crazy cityscape, so this Batman would fit right in and not get engulf by it. Perfect for merchandising like happy meals, back packs and kids toys. The bat symbol alone on his chest would be a cool teaser poster. I would love if this artist went further and did a Drew Struzan style poster. These concepts look very legit and very inspiring. I think mouth would work if the movie used a motion capturing effect like in avatar giving it that interesting future tech look. Maybe get Ridley Scott to direct the movie and there you have it. Or that would be too much like Blade Runner? the design is lovely for a ‘batman beyond’, perhaps a little fussy with all the seams but it i can easily see it working in a future gotham. i’m sorry to say though that the second image is just awful. what on earth is going on with his leg?! I prefer the top illustration. It adds just enough detail to the costume to make it look realistic. I like the little…rib strip things on his sides. They suggest muscles and strength, but also armor and protection. The second view, from the back, just looks busy. The thin white lines seem to add a lot of unnecessary detail. And if this were a comic book design, most artists wouldn’t bother to draw them unless they had to do an extreme close-up. (Also, I must admit I am a proponent of simpler, animation-based designs for comics. They’re just easier and faster to draw, especially for less-talented artists.) Even if this were a design for a movie costume, I still think the lines would be distracting. @ Erin – this is for a movie, so the simple all black look wouldn’t really translate well. @ G.D.- Agreed, while it adds alot of detail, alot of the glowing circuitry and the over done back are a bit much. If they ever do this they should take a cue from the look of Spiderman 2099 from “Shattered Dimensions,” which itself took cues from “Batman Beyond,” and have the glowing ciruitry pulsing, so it doesn’t always glow, mayeb upon impact or if damaged. I love the top illustration. Everything about it is just perfect to me. That being said I also love the suit and the embellishments that have been made. If I had to say anything against it, it would be the colour of the wings should be red, slightly longer ears and to rework his chin a little. Other than that, it’s flawless. The only thing I don’t like about this is the mask. Those little chin spikes just seem unnecessary. I don’t really know how they should go about making a mask that covers his entire face but still has an opening for his mouth, but I think CGI might just be the best way for creating an effect like that. Still, the rest is great. I always thought the next logical step after Christopher Nolan ends his run on Batman would be to make a B.B. movie. Especially since there would be no problem when it comes to recasting Bruce Wayne as an older man. It would be the most appropriate way to continue the story, providing of course that Bruce Wayne isn’t killed of in this next movie. Even so, they could always have it take place separately from Nolan’s universe. The greatest strength of the original Beyond suit is its simplicity; it’s such an elegant design, absolutely no fat on it whatsoever. It’s also a very, very tough outfit to make credible on a real human being, because so much of it relies on acceptance of things like bulletproof morphing light-sensitive fabrics that look and behave like normal cloth. That’s the whole point of the design, far as I’m concerned – it does things that it should not be able to do, and makes Batman properly terrifying, even in a future world where this level of tech is becoming more and more commonplace. So I see there Bourraine is going with this – he wants to put out that this is incredibly advanced armour. And of course, the easiest way to make things look “advanced” is to bung loads of totally unnecessary LEDs on everything and make it out of neoprene. They’re very accomplished renders but I think he can do better insofar as the design’s concerned; this is very tame-future, a not terribly imaginative overworking of a really striking, beautiful original. Alex Ross knows where it’s at. That 3D render John posted might have made a bit of sick come out of my eyes. That is horrible! Sorry for the triple post, but. I think maybe it could, if handled sensitively! Did you see Attack The Block? The monsters in that are sort of what I’m thinking for a “classic” Beyond live-action suit – not just black fabric, but darkness, a shape where there is simply no light – no reflections, nothing, just a gap in the world, emphasised by the striking appearance of the vivid red chest symbol and those piercing white eyes. He should look like a demon, not a man in a costume. I love the concept of Batman Beyond being a movie. I could see it working but it would call for a major budget to capture the Gotham of tomorrow. I love the costume but I’d lose the chin spikes and lessen the lines on the suit. It looks too busy with all those seams. I’m sure we can find a balance between one extreme and the other. This seems like it has a bit of the ‘Batman Returns’ suit in there…which I really like. Intentional or not it’s a nice suit. First thing that came to mind was a redesign that reminded me of Ultraman or basic tokusatsu design. It’s cybernetic, but still looks like it clings to the skin like a wetsuit. I’m loving how he’s integrating accessories into the suit. The utility belt comes to mind in the original Timm design, and in this version, I can dig the “where’d-he-pull-that-gadget-out-of? vibe. But one gripe about the the full image of the costume, it looked mighty sleek in the article preview, but then I saw the full image and the bottom half just screamed “Tacky-Latex” to me. Would really like to see a Beyond movie, even it’s still animated. Love that series, so much…would really like to see it continued.